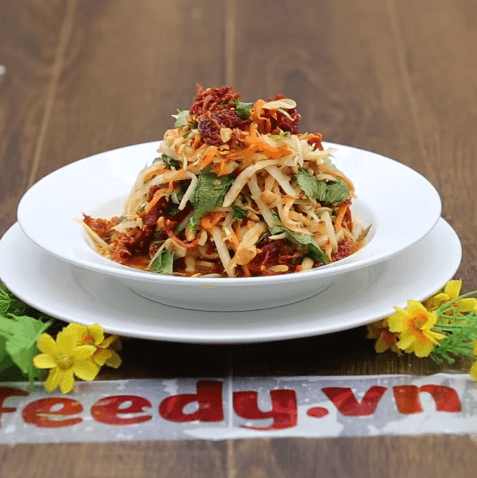 Vietnamese Beef Jerky & Green Papaya Salad Recipe (Đu Đủ Bò Khô) is a traditional food in Northern Vietnam, including papaya, peanut, beef jerky, coriander, basil, vinegar, chili pepper, garlic, sugar, salt, and fish sauce. This is also a famous snack of Saigon (Southern Vietnam). Crispy papaya and beef jerky make an irresistible dish. 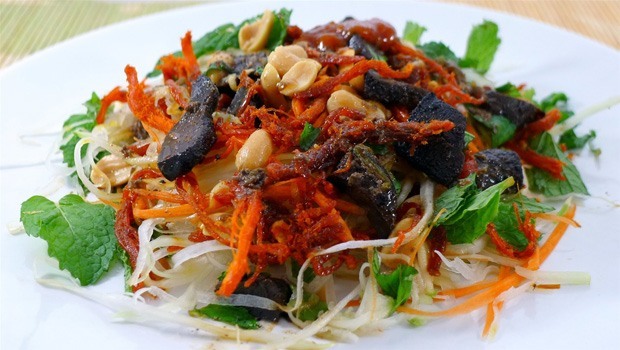 The way to make this beef jerky & papaya salad is very simple, so you can make this salad at home for everyone to enjoy. • Firstly, with papaya, you cut it in half, remove the guts, and rinse. 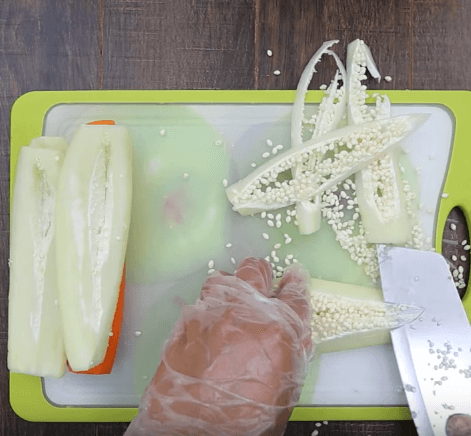 You scrape papaya with a knife quickly and evenly, if more meticulous, you can cut into thin fibers, so papaya will soften better than using a scraper knife. • Next, you peel a carrot and then wash it off. Use a knife to cut into thin threads. • Wash off coriander and basil, and then you chop them up. • Note: you can rinse papaya and carrot out again after cutting and then use a towel to squeeze for drainage or you can leave it alone to look fresh and crispy. • Depending on the amount of papaya in order to make the moderate salad dressing. Normally, with a medium sized papaya, you can scrape up 500 grams of papaya. You will mix with a ratio of 350 ml vinegar, 200 grams sugar, 1 teaspoon of fish sauce, 1 teaspoon of salt, some monosodium glutamate (MSG), chopped garlic, chopped chili pepper, and then mix them well. • With the beef jerky, if beef jerky has ripped, you can use immediately, but if your beef jerky are pieces you have to tear into fibers. • You put papaya and carrot into a large bowl, then you pour the above salad dressing into this bowl, and you stir evenly. 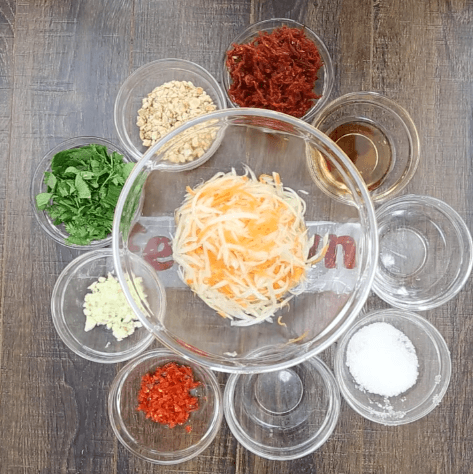 You should use chopsticks or nylon gloves to mix cleanly. • Then, you put beef jerky, roasted and crushed peanuts, chopped coriander and basil into this bowl and you mix all together again. 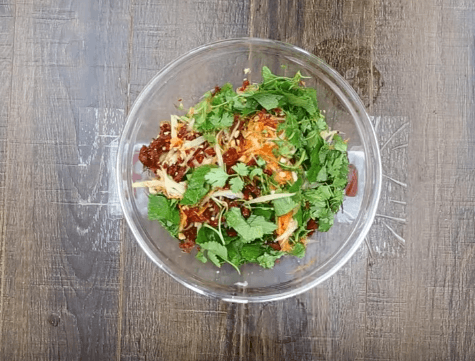 • Finally, you get the mixture to the plate, sprinkle a little more beef jerky fibers, roasted and crushed peanuts, and coriander onto your salad plate to increase the aesthetics of the dish and make it look more attractive. You can squeeze a half of lemon and pour its juice to your dish and you can enjoy immediately. 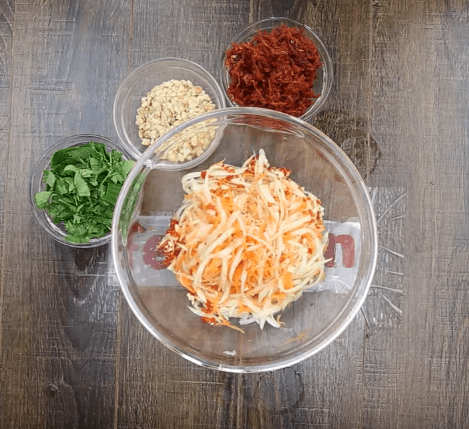 With the above detailed instructions, I hope that you can make the Green Papaya Salad Recipe at home easily and quickly for your family to enjoy!